If you love beautiful, fashionable clothing for reasonable prices, then you’re sure to love a discounted K&G Fashion gift card! Not only do they have the greatest styles, but they carry the name brands you love too: Ralph Lauren, Steve Madden Anne Klein, and Michael Kors- just to name a few. With prices up to 60% less than department stores, you’ll find everything you need for less money. 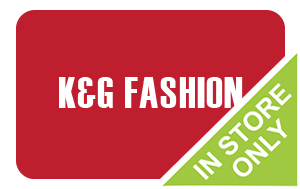 Now just imagine the savings you will get when you use a discounted K&G Fashion gift card! Quality, stylish clothing for the entire family for way less than you can find anywhere else! Whether you’re shopping for work, school or play, you will find it here and for far less money out of your wallet! We know how difficult it can be to look great while staying within your budget. Seasons change, styles change, but price tags have a way of staying the same. But not anymore! You’ll be delighted with the savings you will get with you discounted K&G Fashion gift card! Never before has it been so easy and affordable to look your best! Whether you shop online or in the store, you will pay less money on your entire purchase! And don’t forget, gift cards make excellent presents too! Not only can you buy a K&G Fashion gift card from Cards2Cash, but we also offer lots of other discounted cards for department stores, restaurants, shoe shops and more. In fact, we work to bring you as large a variety of gift cards to choose from as possible. To save more money every day, check out our listings for T.J. Maxx, Marshal’s, Nordstrom Rack, Dillard’s and more! With Cards2Cash on your side, you can look fantastic, while keeping money in the bank! Why Not Get Cash for Your Unwanted Fashion Gift Cards? Do you have a K&G Fashion gift card that you aren’t going to use? Cards2Cash will turn your unwanted gift card into money in your pocket! We pay top dollar for gift cards for department stores, restaurants, gas stations and more. If interested, just visit one of our retail locations for on the spot payment OR simply fill out our easy online form and we’ll quickly get back to you with an offer for your unwanted gift card. Whether you buy your gift cards from Cards2Cash or sell them to us- we’re your one-stop gift card shop!